New improved version of the crossover calc this now includes a graphical plot of the frequency response. Due to the size of the graphics, the form below will submit to a full page version of the calculator. You can select 1st order or 2nd order slopes, with the option of Linkwitz-Riley on 2nd order. We will add 3rd order and 4th order in due course. This calculators works two ways, you can enter the frequencies and impedances and calculate the component values, or you can enter the component values to get the crossover frequencies and see the frequency response. This version also allows different impedance and frequency between Low Pass and High Pass, as well as different slopes. So you could for example have the Low Pass section with a 8 ohm woofer, crossing over at 1200 Hz, and the High Pass at 16 ohms crossing over at 1800 Hz. Combinations like this are becoming increasingly common, as using a 16 ohm HF driver often negates the need to put attenuation in the HF part of the circuit. Also, a typical 1600Hz Butterworth crossover can often have a peak in response around the crossover frequency, particularly if the HF driver is highly efficient – offsetting the crossover frequencies may seem counter-intuitive as it might appear you are leaving a hole in the response, but often the coupling between LF and HF counteracts this. If you already have a crossover, you can simulate the response using the lower part of the controls. Please check you have component values correct, Capacitors should be specified in microFarads (uF) and Inductors in milliHenries (mH). Most pre-built crossovers will have capacitor values printed on the components, unfortunately very few divulge the Inductor values, to get these you will need an appropriate measurement meter. Cms is a measure of the suspension compliance. Compliance is the opposite of stiffness. A driver with a stiff cone suspension will have a low Cms, and a driver with a ‘loose’ cone suspension will have a higher Cms. Vas is known as the compliance equivalent volume, and is specified in litres. Cms is proportional to Vas, a higher Cms will mean a higher Vas, but what does the Vas figure actually represent? You could think of the stiffness of the suspension as providing a restoring force that brings the cone back to it’s central ‘neutral’ position. If you were to gently push the dust dome of a driver with your fingertips, one with a stiff suspension would push back harder than one with a loose suspension. Imagine a situation where you have an imaginary driver mounted in a sealed box, with an infinitely compliant suspension – ie a suspension that offers no resistance whatsoever to movement. 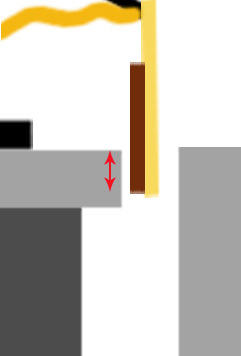 If you were to push the driver cone back into the box, the cone moving back into the box would compress the air inside the box slightly, and when you release the driver cone, the air would push back to restore the cone to its original position. In a box with a small volume, the air would compress more, pushing back harder. As the box size increases, the same distance of movement of the cone will compress the air inside the box less, resulting in a smaller restoring force to push the cone back to it’s original position. The Vas measurement in litres is the size of the ‘imaginary’ box described above, which has exactly the same restoring force as the suspension of the driver. Cms and Vas are effectively two different ways of describing exactly the same thing, the main reason for converting Cms to Vas is that Vas fits into a lot of formulae better, and allows easier modelling of driver performance. Air temperature, air pressure and humidity can have a significant effect on Vas measurements, and it is quite common for variations of up to +/- 20% from published specifications. This is a combination of differences of measurement environment, and manufacturing tolerances. Vas can be used for determining optimum box size for sealed speaker boxes (ie. NOT vented). If your sealed box is too big, the air inside the box will will slow the driver from returning to it’s central rest position rather than help it, this can make the box overdamped. Many people consider being slightly overdamped as the best option, as it gives a more accurate sound, but it will often reduce the output volume. For Bass speakers, critical damping, or ‘perfect’ damping is often what is sought after, this gives the best compromise, where the air inside the box helps restore the driver to it’s natural position, but not too much, and not too little, but just right. A speaker box with a Q of 0.707 is generally regarded as perfectly damped, you could think of this as the Goldilocks Q, where it’s ‘just right’. Qts is the total Q of the driver, available from the manufacturer’s specification sheet. For purposes of some simple maths, let’s use an imaginary driver with a Qts of 0.35. Its not unusual to see boxes with a Qtc of up to 1.1, higher Qtc of around 1 is slightly underdamped and will cause a peak in bass response around the resonant frequency, giving the impression of a better bass response. In reality you will be sacrificing deep bass response for upper bass response, and with reduced sound quality and less control of the driver, increasing cone excursion and the possibility of over-excursion. The results are the same, just the formula has been re-arranged. Vb is the box volume. Some people prefer to use Vc for closed box, and Vb for reflex box. As a general rule of thumb, drivers with a high Vas prefer a bigger box to get the best results, and you should take this into consideration when choosing the driver for your application. The formulae here are for sealed boxes only, bass reflex boxes require different calculations which we will cover elsewhere. To save you time, we’ve put together a calculator for one of the most common passive crossovers, a 2nd order Butterworth. 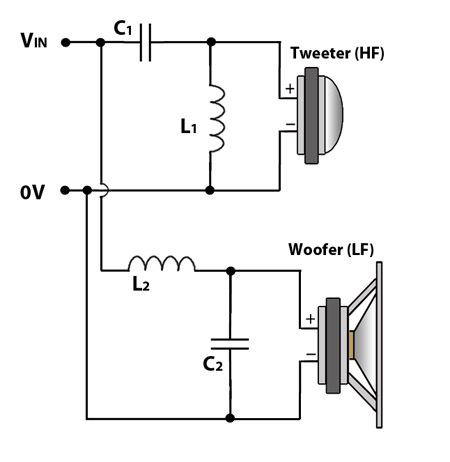 You can configure the Impedance of the woofer and tweeter, and the crossover frequency. Where Vin is connected to the positive terminal of your amplifier, and 0V is the negative terminal. The dots on the circuit signify where components/wires are connected. L2 connects to the input, and NOT to 0V, hence the ‘loop’ in the wire in the diagram. The Thiele Small Parameters (often referred to as T/S Parameters) are provided in specification sheets by most manufacturers – but what are they for? If you read through the section on parameters you’ll get a more detailed explanation on the significance of each parameter, but put simply they are a set of parameters which define the electromechanical properties of the loudspeaker driver, which are a measure of how it behaves electrically, and mechanically. Once you understand some of the basics of the Thiele Small parameters, you will know what to look for when it comes to choosing a loudspeaker driver. If you’re not interested in the nitty gritty, then it’s probably sufficient to be aware that the parameters are normally used when it comes to doing simulations of loudspeaker behaviour for purposes of optimising cabinet design. For those of you who are keen to understand a little more about these parameter, you should find almost everything you need to know in this section. Mms – The Moving Mass of the cone, including air load. Xmax – Maximum Linear Excursion of the cone and voice coil. Re is the DC resistance of the loudspeaker’s voice coil, you should not confuse this with impedance, although related, the two are different. Measuring the resistance of a speaker with a multi-meter, the reading you get across the terminals should be close to the manufacturer’s specified Re, it’s not unusual to get a minor variation from manufacturer’s published specifications, chances are the Voice Coil resistance will actually be correct and your multi-meter is what’s wrong. So why is Re around 5-6 ohms, but the impedance specified as 8 ohms. Let’s look at what Re actually signifies, it’s the DC resistance of the wire in the voice coil. If you were to unwind your voice coil, and run it out in a straight line, connect it to a battery or other power source you could predict the current through the wire using ohm’s law: V = IR, and this resistance would be an accurate measure of how much the wire resists the flow of DC electrical current through it. All good so far, but when you wind copper into a voice coil, you create an inductor. An inductor will still behave like a straight wire when it comes to DC, (Direct Current) however, inductors behave differently when subjected to AC (Alternating current) signals. The output from your amplifier is an AC signal, as it alternates in polarity and varies in amplitude. Inductors resist change in current, when you apply an AC signal to an inductor it will create a back EMF to try to resist the change of current, creating additional ‘reactance’, when you add the reactance to the resistance, you get the driver’s impedance. If you want a simple analogy for an inductor, you could compare it to the suspension of a car, putting weight in a car will make the shock absorbers compress a little, they resist the change, but then remain static doing nothing this would be like applying a DC signal to an inductor, it resists the initial flow of DC current, but once current is flowing the inductor does nothing. If you then drive over lots of bumps, the suspension works by creating a force that pushes back to resist all the little bumps, preventing the force of the bumps reaching the car body, in much the same way that an inductor blocks high frequency signals by creating a back EMF. The rising impedance from 1 kHz upwards is caused by the loudspeaker’s inductance. You can see from the above impedance curve that an amplifier will see a higher impedance of nearly 25 ohms at 5 kHz, which would significantly reduce the power that can be delivered to the speaker at those frequencies. To get better high frequency response, the inductance needs to be kept as low as possible by adjusting the voice coil geometry. 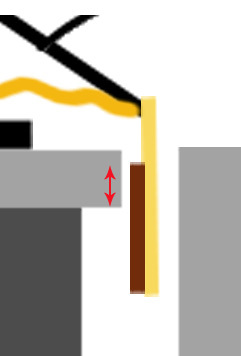 In some cases this is not possible, so to improve high frequency response a common feature is to include a copper shorting ring in the pole piece of the speaker, this creates a short circuit for induced back EMF, reducing the impedance at higher frequencies and extending the mid-range response. You wont find copper shorting rings in drivers designed for sub-bass or bass applications, as it’s not needed, and they are most often found in higher quality drivers designed for better, smoother high frequency response. Used correctly, the shorting ring can extend higher frequency response by a few kHz. In the above graph there is also a large peak just above 40Hz, this corresponds to the driver’s resonant frequency. The resonant frequency is the point that the driver will naturally move the most, where the compliance of the suspension and spider for the given moving mass are most susceptible to oscillate. The peak in impedance is caused by the back-emf of the moving coil. The more the cone moves, the greater the back-emf. Since the cone moves most at the resonant frequency, this is where the back-emf will be greatest. An impedance of 40 ohms or more will significantly reduce the power delivered to the speaker by the amplifier at those frequencies, but at the same time the speaker will naturally want to move more easily at the resonant frequency, requiring a little less power to achieve a given excursion. You’ll notice also that the mid-band frequencies show a relatively flat response in impedance, this is where the excursion of the speaker is low, and the impedance will most closely match the ‘nominal impedance’ of 8 ohms. The 8 ohm rating given to loudspeakers is the average impedance across the drivers main operating range. It’s useful for approximate power calculations and simpler designs, however for more advanced designs it is often desirable to measure the exact impedance at particular frequencies so that variations can be compensated for at the design stage. Re is used in conjunction with Le (inductance) for purposes of simulating driver performance. If you’re comparing drivers in detail, it will help to understand some of the more intricate TS Parameters, as over time it will help you differentiate between different drivers and identify which applications they are more suited for. For example, for a high power 18″ horn loaded bass bin, you will probably be looking for a driver with a high BL, and also a good strong cone. A strong cone will generally also be a heavier cone, so you’ll be looking for a driver with a relatively heavy cone. For a 12″ mid driver, that wont be doing any bass, but mainly focused on vocal reproduction you will want a driver with a precise response, and a light cone. Mmd is the mass of the moving parts of the driver; the diaphragm, dust dome and voice coil. The diaphragm is the paper cone in a standard speaker. 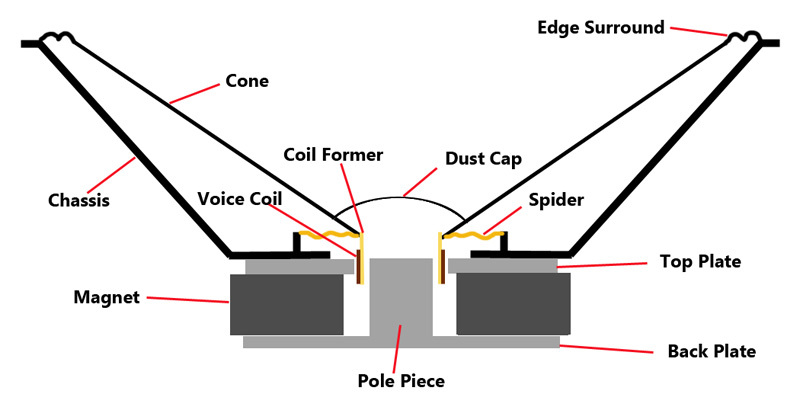 The voice coil includes the former and the copper wire. Most definitions online for Mmd seem to just be copies of each other, citing that the surround and spider are included in the moving mass. A bit of further research has suggested that only part of the mass of the spider and surround should be included, as the outside edge of the surround, and the outside edge of the spider are both glued to the chassis, and therefore DO NOT MOVE. Mms is commonly used in loudspeaker modelling software. It is Mmd plus the ‘air load’. The air load is the air just in front, and just behind the speaker cone that will tend to move back and forth with the cone. It’s just a few grams of air, but for mathematical modelling of speaker performance, needs to be added in. A larger cone will have a larger air load. Mms is used to calculate other TS Parameters, such as Qes and Qms. We’ve mentioned this before, and just to hammer the point home here, you really, really should be aware now that all driver parameters are dependent on each other. The fact that cone weight, voice coil geometry, magnet strength, cone stiffness all interact and affect each other in both positive and negative ways means that any speaker design always has some compromises. Some might call this optimisation – a driver specifically designed for the best sub-bass response will sacrifice mid and upper bass response. To get lower frequencies for better bass, you will use a heavier stiffer cone. Whilst in theory, for lower resonant frequency you can keep increasing the cone mass, the drawback often be lower efficiency, and to counter this you need a stronger magnet, and also a longer voice coil for better motor strength. Its unsurprising that in many instances, a compromise is settled on, which balances efficiency, resonant frequency, and cost. To improve the mid range response of a driver, you would look at making the cone lighter, but that would potentially increase the resonant frequency, fine for mid-range drivers, not so good for subwoofers. As with most things in life, you can’t have your cake and eat it, and the only way to cover the whole frequency range more effectively is to use different drivers optimised for specific tasks. Unless you’re getting into more advanced levels of speaker cabinet design, the motor strength isn’t normally something you need to worry about too much. To some extent, it’s safe to assume that the manufacturer will have set the motor strength appropriately for the design of the driver, but it will still be useful to have a basic understanding of this parameter, and it’s significance. Put simply, the motor strength (BL) is a measure of how strong the magnetic field within the voice coil gap (B) multiplied by the length of voice coil that is active in the magnetic field (L). For a more detailed explanation, with diagrams, please see the article on Xmax: https://speakerwizard.co.uk/driver-ts-parameters-xmax/ which includes diagrams of the magnet structure, and magnetic fields. With standard ferrite magnets, a stronger magnetic field is generally achieved with a bigger magnet. The bigger the magnet, the heavier the magnet. The heavier the magnet is, the stronger the chassis needs to be, and you’ll also need to ensure strong glue to bond the magnet to the top plate, and the back plate. Increasing the magnet size and chassis strength will make the driver more expensive, but don’t let a big magnet fool you, this isn’t necessarily a sign of a high quality premium speaker though, I’ve seen a number of drivers with big magnets that are not much use for anything other than picking up nails off the floor. In order to keep weight down, neodymium magnets have become more common, these have the ability to generate very strong magnetic fields from surprisingly small, light magnets. Using a neodymium magnet on a driver can have a massive impact on the overall driver weight, which is becoming quite desirable for small portable systems. You will have to pay for the privilege though, as neodymium magnets are often significantly more expensive that ferrite. Don’t forget that BL is also dependent on the length of wire in the magnetic field, so the height of the magnetic gap will also affect the BL product. If you’ve read the article about Xmax you’ll hopefully start to realise that there are a number of loudspeaker parameters that are dependent on each other. The voice coil design will have an impact on the Xmax, and since BL takes into consideration the length of wire, it will also impact on BL. The diameter of the voice coil and the gauge of wire used (how thick the wire is) will have a very direct impact on the length of wire in the magnetic field. Beyond that, it’s also possible to have multiple layers of wire on the voice coil, and many modern drivers utilise inside-outside wound voice coils, where wire is wound and glued to the inside of the voice coil as well as the outside. BL: Think of this as how good a weightlifter the transducer is. A measured mass is applied to the cone forcing it back while the current required for the motor to force the mass back is measured. The formula is mass in grams divided by the current in amperes. A high BL figure indicates a very strong transducer that moves the cone with authority! Personally I think that is a little too simplistic, but it’s sufficient for someone with casual interest to get a handle on some of the key TS Parameter. To help put things into context, a high BL figure would be considered 30 or higher. A driver with a BL in this range will exhibit very price cone control. A low BL figure would be 20 or less, a driver with a low BL will be significantly less able to control the cone accurately. Depending on your application, you may still be wondering why you should care about BL? If you are planning on building a horn loaded bass bin, or scoop bin, a high BL is pretty much essential, you wont get away with just chucking any old driver into the cabinet and get the right results. If you consider that in most horn loaded applications you are having to compress air, you want a driver that exhibits a high force to achieve this compression, a strong motor makes this possible. In other applications, if you were to make a listening comparison between a high BL driver with a low BL driver, you would find the high BL driver will sound much tighter and more accurate. Generally for live music applications this type of sound is preferred as it will more accurately reproduce the instrument sounds. Low BL driver can sound ‘woolly’ or ‘muddy’ because the cone does not respond to transients as quickly, and has the potential to introduce some distortion. Some people prefer this sound as it can give a warmer bass sound. High BL drivers are generally needed for high power bass applications, where a large heavy cone is used. High BL drivers are usually more efficient, as the higher motor strength equates to more pushing power. For mid-range drivers, it is normal to use a much lighter cone, and a high BL is not necessarily needed, but can contribute to a more accurate response. High BL drivers make it possible to use smaller sealed boxes in some designs, because the motor strength is so high, the restoring force of the air in the box, and the suspension of the driver, are small in comparison, making them relatively insignificant. High BL causes high electromagnetic damping, and in some cases this is undesirable, in fact with reflex boxes it can cause problems with the reflex ports being under-damped and requiring modification, often with bass reflex designs a slightly lower BL is more appropriate to get a more balanced result. We’ll discuss BL and voice coil geometry more in another article. Possibly one of the most misunderstood parameters, most people know Xmax concerns driver excursion, but dont really know precisely what it means, and it is probably the name that confuses people, as it is slightly misleading. We’re used to letters X and Y denoting dimensions, and in this case, X does relate to a dimension, it’s to do with the distance a loudspeaker’s voice coil travels back and forth, so it’s all good so far – but the ‘max’ is what throws people. Its natural to assume max means maximum, and the conclusion most people reach is that X max means maximum excursion in dimension X, which is nearly right. What’s missing is the word linear. Xmax is generally regarded as maximum linear excursion – but what exactly does that mean? 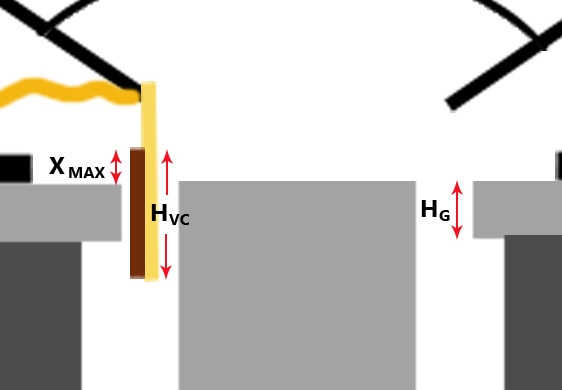 Where HVC is the Height of the Voice Coil, and HG is the Height of the magnetic Gap. To understand this we need to look at how the components of a loudspeaker fit together, this is a simplified cross-sectional diagram of a common loudspeaker. 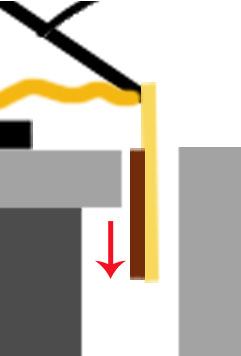 Now, let’s look in more detail at the area around the voice coil, we’ve removed the right hand part of the voice coil to make the diagram clearer. You can probably now see why Xmax is often referred to as Voice Coil Overhang. It’s the amount by which the voice coil overhangs the magnetic gap, but why is this significant? Let’s take a closer look at the static magnetic fields in a loudspeaker. These are the fields generated by the magnet, rather than the fields generated by the voice coil. This is a simplified diagram, intended to show the most significant path of magnetic flux. 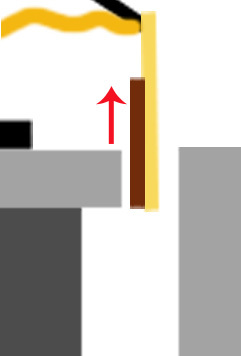 There will also be stray flux outside the speaker, and inside the air gap between the magnet and pole piece, and in a real speaker, the field lines are unlikely to quite as uniform as in the above diagram, but it should be sufficient to see the general principle of how the magnetic field is acting. The permanent magnet has a north pole at one end, and a south pole at the other. Depending on the speaker manufacturer, it’s normal for the pole piece to become the ‘north pole’ and the top plate to become the south pole. The shape of the top plate, and pole piece helps focus the magnetic flux, and you will notice the lines of flux are closest together in the magnetic gap – where the voice coil would normally be. Since ferrous materials are much more magnetically permeable than air, by a factor of about 400. Magnetic flux will tend to take the route of least resistance, in much the same way as electricity does, this will mean the magnetix flux will tend to want to travel through the metal parts of the speaker. Where it reaches the gap it will continue to go down the route of least resistance, which in this case will be the shortest distance through the air, ie straight across the gap. The flux is squeezed together across the gap, causing the flux to flow in parallel lines across the gap, creating a uniform, linear magnetic field. Traditionally Xmax was calculated mathematically using the simplistic formula mentioned earlier, this is because many earlier speaker designs used relatively weak magnets, and it was assumed that the magnetic field would drop off very significantly just above or just below the gap, and would be of little or no use. When you pass electrical current through the voice coil, it will create its own electromagnetic field, which will push against the magnetic flux in the voice coil gap, causing the voice coil to move. If you keep driver excursion within Xmax, there will always be the same height of voice coil within the gap. The diagrams below show the maximum excursion in each direction to keep within mathematically calculated Xmax. Since the magnetic field in the gap should be linear and uniform, and the height of voice coil within the gap remaining constant, mathematical models can be created to predict driver behaviour. Working outside Xmax will cause those mathematical models to become inaccurate, as well as potentially introducing distortion and other poor performance. 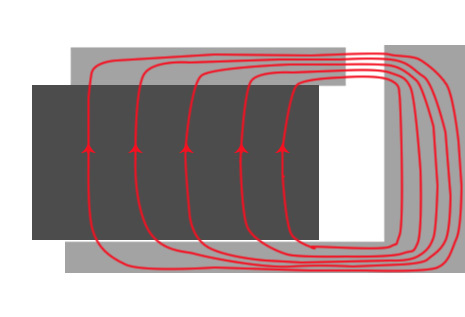 Moving the voice coil any further up or down in either direction, as in the diagrams below, would cause the height of the voice coil that is within the magnetic gap to become shorter, shown by the red arrows. You can clearly see this is less than the Gap Height. Less Voice Coil in the magnetic gap, means less pushing force moving the cone, which is where the non-linear behaviour starts, hence the term maximum linear excursion. The cone will still move, but it will no longer be optimal performance. It is becoming increasingly common to use stronger magnets in modern designs, which can sometimes mean that useful magnetic flux (although slightly weaker) will also be present just outside the gap, and magnetic field strength may still be acceptable in this area. Depending on the magnet strength, and other factors, Xmax when consider to be a measure of maximum linear excursion can actually be 25%-40% larger than mathematically calculated Voice Coil Overhang. So when you are comparing one brand of driver to another, you need to be aware that the Xmax figures may be calculated differently, and a driver with a specified Xmax of 7mm from one manufacturer (using Voice Coil Overhang) could in fact have a very similar performance to one from another manufacturer with an Xmax of 10mm, who has perhaps used a different mathematical model and/or tolerance to determine the limit of linear excursion. The best solution may be to determine Xmax by measurement rather than simple maths, and there is a growing trend towards using Klippel Analysis to determine Xmax more accurately, the driver is progressively driven to high levels at low frequencies, and Xmax is determined by measuring excursion at a level where 10% THD is measure in the output. This is believed to better represent actual driver performance, however is quite time consuming, and can be difficult to measure, consequently many manufacturers do not bother. What is the significance of Xmax? Cone excursion is related to loudness, especially with deep bass frequencies in a bass reflex cabinets. To reproduce bass frequencies at high volume you need to move a lot of air, and to move that air your speaker cone needs to move a lot. A bass driver with a low Xmax will generally not be designed to reproduce bass frequencies at high power, as it simply can not move enough to do the job. There is an exception to this in horn loaded bass cabinets, where excursion can be restricted, and Xmax may be less critical, depending on the design. Will exceeding Xmax damage the speaker? You can in most instances exceed Xmax without causing mechanical damage to the voice coil, however you should take note that exceeding Xmax can reduce the power handling due to detrimental effects on voice coil cooling. Depending on the driver design, other things to consider when exceeding Xmax is the mechanical stresses on the speaker components, such as the spider, and where the spider joins the cone and coil former. There is potentially a large force acting on these components, stretching and pulling them beyond their designed limits. Whilst you can often exceed design parameters a little without causing damage, it would not be a sensible idea to exceed Xmax significantly as you will reduce the useful working life of your speaker. The resonant frequency is influenced by the weight of the cone and voice coil (sometimes referred to as the moving mass) and the stiffness of the parts that return the cone to it’s central natural rest position. If you were to apply a sine wave signal to the speaker outside of a cabinet, the speaker cone’s movement back and forth from rest position (known as excursion) will be significantly more at the resonant frequency than at higher frequencies. Just as in the instance of the bridge being ripped apart at it’s resonant frequency, care has to be taken to avoid damaging your speaker. We wont get into the finer points of this here, but it’s something to be aware of, and you should be aware that many speaker designs recommend the use of a High Pass Filter, typically just near the resonant frequency of the driver being used. Cabinet design can influence the recommended HPF, as for example in Bass Reflex Designs, the tuning of the reflex port can actually reduce cone excursion at the resonant frequency, but have the side effect of allowing increased excursion just below the resonant frequency. The purpose of the HPF is to keep the driving operating within a frequency range that does not allow excessive excursion – without the HPF it is possible to damage your speakers through excursion without exceeeding the power handling capacity of the speaker. Its generally a safe bet for most designs to assume your driver wont be able to effectively product frequencies below it’s resonant frequency, and from a simplistic point of view, using a HPF just above the driver’s resonant frequency is a good way to stop your drivers being ripped apart from over-excursion. A driver with a resonant frequency of say 50Hz will not be effective at sub-bass in the 30Hz region, so would be a poor choice for this application. A driver with a resonant frequency of 30Hz would probably work well from 33 Hz upwards, subject to an appropriate cabinet design, so could be used for sub-bass. Certain speaker designs (such as horn loaded speakers) work a little differently, and different results can be achieved. However, if you are replacing an existing driver in a Ported Bass Reflex cabinet (one of the most common types), it’s generally a good idea to choose a replacement with a similar resonant frequency. The original speaker cabinet would have been tuned to match the driver, and putting in a significantly different driver will result in a mismatch, resulting in less than optimal performance, which in serious cases can result in premature failure of a driver due to over-excursion. For serious sub-bass applications, the lower the Fs, the better. For mid-range, the resonant frequency of a cone driver is often irrelevant, as the operating frequency range will usually be significantly higher than the resonant frequency. In compression drivers, the resonant frequency needs to be taken note of. Its normal to use compression drivers well above their resonant frequency, a typical 1″ exit compression driver would have a resonant frequency of 500-600Hz, and it’s normal to specify the minimum operating frequency an octave higher, which would be 1000-1200Hz. At it’s resonant frequency, the diaphragm on the compression driver will naturally move a lot more than normal, in a compression driver this can be catastrophic, as the metal dome on the compression driver can hit the front of the housing, and cause the diaphragm to shatter. Keeping an octave above the resonant frequency ensures the compression driver’s diaphragm stays within relatively low excursion limits. It’s possible to damage diaphragms with bass and mid frequencies quite easily, it is for this reason that it’s common to put in a 1st order high pass filter ( a single capacitor) in series with a compression driver when it is used in an active system. This protects against accidental erroneous connection to the wrong amplifier, and it’s good practise to do this if your system has numerous connectors which look similar. Cms is a measure of the suspension (surround and spider) compliance. Compliance is the inverse of stiffness. High stiffness is low compliance. Low stiffness is high compliance. Stiffer suspension will make the resonant frequency higher, looser suspension will make the resonant frequency lower. Mms is the mass of the moving parts of the driver, including ‘air load’. A heavier cone will have a lower resonant frequency, and a lighter cone will have a higher resonant frequency. You can read more about Mms here: https://speakerwizard.co.uk/driver-ts-parameters-mmd-mms/. When selecting speakers, it’s common for people to just look at maximum power handling, and many manufacturers make a point of specifying seemingly unbelievable power handling capacity of 1000W or more. Its quite rare for manufacturers to specify power compression though, and it seems to be often overlooked by system designers. It seems that loudspeakers to handle what appear to be insanely high levels of power compared to 10 or 15 years ago. Has there been some amazing technological breakthrough? Do we need to re-write the physics text books? No, it’s still just basic physics – so what are the changes? Firstly, modern materials used in the construction of voice coils are able to withstand significantly higher temperatures before failing. Why is this important? Well Cone loudspeakers are in fact very inefficient, with even the best transducers only converting around 5% of the electrical energy supplied into sound, the majority of the remainder is converted into heat. So a 1000W bass speaker running at full power may well be converting only 50W into acoustic power, and 950W of heat. Thats like having a 1kw bar heater in your bassbin! That’s a lot of heat, which can cause big problems. Aside from improving construction materials, manufacturers are also refining designs to maximise heat transfer away from the voice oil, this also contributes to the increases in power handling capacity we are experiencing. What’s all this got to do with power compression? Enabling speakers to handle much higher temperatures might seem a good thing, as it increases maximum power handling, but it also has a detrimental effect. Most voice coils are made from copper or aluminium wire, both of which have a positive temperature co-efficient of around 0.4% per °C. What’s the significance of that? You will have heard of superconductors, which operate at extremely low temperatures in order to try to reduce and minimise resistance. Loudspeaker voice coils unfortunately work in the opposite way: as the temperature increases, the resistance also increases. A modern state of the art voice coil is designed to withstand extremely high temperatures, often operating at up to 3000C or more when driven at full power. 0.4% may sound insignificant, but remember this is per °C – at only 2300C the voice coil DC resistance has almost doubled which causes the voice coil impedance to increase accordingly. Some simple maths and you can quickly see that the increase in temperature can make your 8 ohm speaker start behaving more like a 16 ohm speaker. So after setting your sound system carefully at the start of the night, an hour in, and it doesn’t sound as loud – you might wonder whats going on. Two things: firstly, your ears have a self defence mechanism: there are 2 tiny muscles in the middle ear that will contract when the ear is exposed to loud sounds. This contraction will reduce the loudness of the sounds reaching the inner ear, thereby protecting the inner ear against exposure to loud noises. This isn’t power compression, but it’s something to be aware of, as you may well be tempted to turn up the volume, I know from experience that a typical DJ will certainly try this, and end up running his mixer into overdrive in the attempt to get more volume. The second factor is power compression, a typical loudspeaker can lose 3-6 dB of volume once power compression kicks in. You could think of power compression a bit like the aerodynamics of driving a car. When you start moving, a certain level of power from your engine sets you hurtling forwards at high speed, but as you go faster, wind resistance increases, so you stop accelerating. You need to apply more power to increase speed, but wind resistance keeps increasing too, so you have to apply even more power. If your amplifiers have headroom, your instincts will make you want to turn them up, to restore the original volume level. To some extent this will work, if you’re familiar with the maths, you’ll see whats going on. Your 8 ohm speaker at room temperature happily accepts 1000W from your amplifier, and gradually reaches an operating temperature of say 250°C. Your resistance has doubled, and your ‘new’ 16 ohm speaker will probably only be receiving around 500W from your amplifier. In a way, as the speaker reaches temperature, it ‘protects itself’ by reducing the power it is operating at, stopping it getting any hotter. If it were to cool a little, the power would increase again, causing it to heat up. Lets suppose you turn the gain up on your amplifiers, determined to try to push 1000W through your speakers. As you apply more power, you will generate more heat, perhaps reaching 350°C or more, with your speakers resistance continuing to increase to perhaps 20 or more ohms. Essentially you are fighting a losing battle, as you turn the gain up, the speaker fights back with a higher resistance. You will eventually reach a limit, either your amp will run out of headroom and you cant turn it any louder, or the other possibility, which happens all too often, is your speaker will overheat, and burn out causing catastrophic failure. Now you know about power compression and the fact that speaker resistance increases with heat, you’ll probably realise that you actually have to push a speaker very hard in order to cause it fail – so if your speaker suddenly fails and you smell burning, the only person to blame is YOU, as you now know better than to try to fight power compression by applying more power. Now consider what effect power compression will have. 3-6dB loss at full operating power is almost like switching off half your PA system. To achieve the same consistent volume you will need twice as many speakers! What’s the solution? Either buy speakers with headroom, e.g. if you want to operate at around 500-600W, you might want to consider purchasing speakers rated at 800W or more. At 75% of rated power, the effects of power compression should be much less significant. Also, try to select speakers with improved cooling technology, that suffer less from power compression. Avoiding power compression could make your speakers twice as loud, meaning you could take half as many to the gig!